I finished painting the Boer goat this week. Now I just need to add a few coats of the Ultra Matte varnish – and paint the cat. He’ll be a yellow tomcat, and I think he’ll look really nice with those yellow eyes on the goat. I used several layers of glazes, made by adding acrylic paint to Golden Acrylic Glazing Liquid. 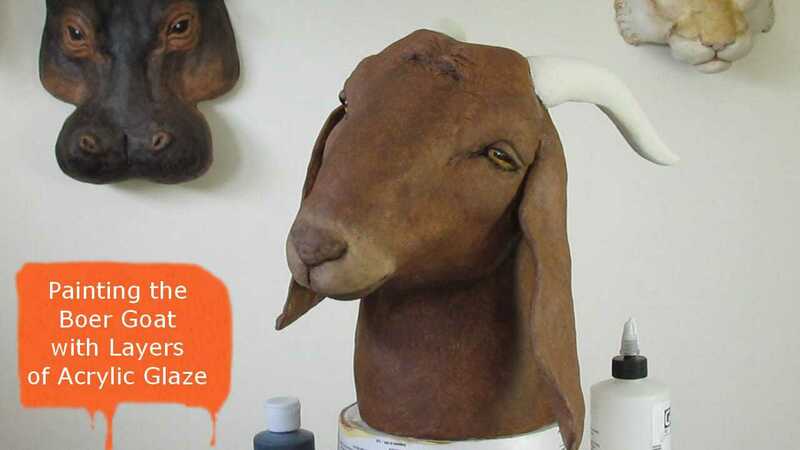 Although the goat was made with Apoxie Sculpt, this same method works really well with paper mache sculptures, too. Except for drying between coats, painting her took very little time. The glaze worked really well for the darker browns, but I didn’t like the light acrylic paint mixed with the glazing liquid. I can’t explain why – it just didn’t seem to work. It was easy enough to get the look I wanted in those areas with watered-down paint, but you do need to be careful to not add too much water. The paint will lose it’s ability to stick to the sculpture if too much water dilutes the acrylic binders in the paint. It’s hard to see in the photos, but the ears really are slightly lighter than the face. 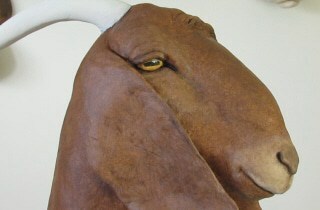 To see the model for this goat, take a look at Eclipse on this page and scroll down towards the bottom. The owners were very nice about letting me link to their site so you could see their beautiful Boer goats. I left off the white spot on Eclipse’s forehead, because it would draw the eye away from the rest of the sculpture. However, I’m still thinking about it. Maybe she should get her spot. What do you think? You can still see just a hint of the original yellow base coat peeking through the light coats of brown glaze, and I think that really helps to pull all the colors together and add some interest in the large areas that are all one color. The tiny, almost invisible texture I added to the Apoxie Sculpt really helps, too – although most people probably wouldn’t notice any texture at all. Gosh, I hope you are pleased with your finished goat. She has such character and seems to be a very sweet goat. Your persistence has paid off. Thanks for the painting tutorial. I do have one question…when you added the darker glaze for the fur, did you wipe it off so that the glaze stayed in the crevices or did you just leave it all dark? Nice job, i love it. Jonni, What you may call procrastination, others would call pondering or deliberation! One can not hurry great art! Even if you are not pleased with the cat, you can keep the goat as a stand alone sculpture and same with the cat if they don’t wind up complimenting each other. They are both so sweet on their own. Will you be putting them on a base or will you attach them to each other somehow? Your goat turned out beautifully! Well worth all the extra effort you put into it. I can’t wait to see it with the finished kitty! Thanks, Karen. I’m glad you like her. You say that paint job was easy to do, and it did look easy as you did it, but somehow I have a hunch if I did it that it wouldn’t be that easy!! I’m so glad you got your goat finished and are happy with it. I love it so much and can’t wait to see the kitty all done and them snuggling together. I love this goat, soooo amazing-your work! Thank you for sharing with all of us, was excited when I got the email this morning. What a great looking goat, such a lovely face. Thanks for all your tutorials they look simple to follow and have great results at the end. Must try harder to accomplish at least one! Thanks Penelope. After seeing your sock puppets (and that wonderful dog portrait!) I’m sure you’ll enjoy paper mache. If you make anything, be sure to take a photo so we can see how it comes out. Sweet looking goat and nice paint job! The goat is great! The cat has to be too. What are you doing for your cold? Thanks, Jim. As for the cold, I’m trying to ignore it. Do you have a better plan? and was amazed every step of the way. I had not seen the rabbit that close up before. The sculpture and the way you painted it, is not just adorable, it is beautiful. Then I found this video and Oh, My. If I took heart medicine, I’d have to take some now. It is exquisite. And both videos were done when you weren’t feeling well. Please feel better soon. I can’t even tell you how much joy you and your art bring. You’re amazing! Wow Jonni the goat is so life like. Can’t wait to see the kitty. You are such a great artist. Went to Joanns and bought a whole new set of acrylics and a gallon of glue and etc. Joanns is a craft store and a lot of fabrics if anyone lives somewhere they never heard of the store. Getting prepared for sculpting the turtle face and eyes. Good luck on your new project Jonni. Joey – Brandon FL.